An agreement is a transaction that takes place between two or more parties concerning a specific issue or agenda where they both agree to the same terms and conditions that has been set. If one party does not agree to any of the terms, then the agreement cannot proceed and cannot be completed. There are many types of agreement in existence and they are equally important and useful to the fields and situations where they are required. 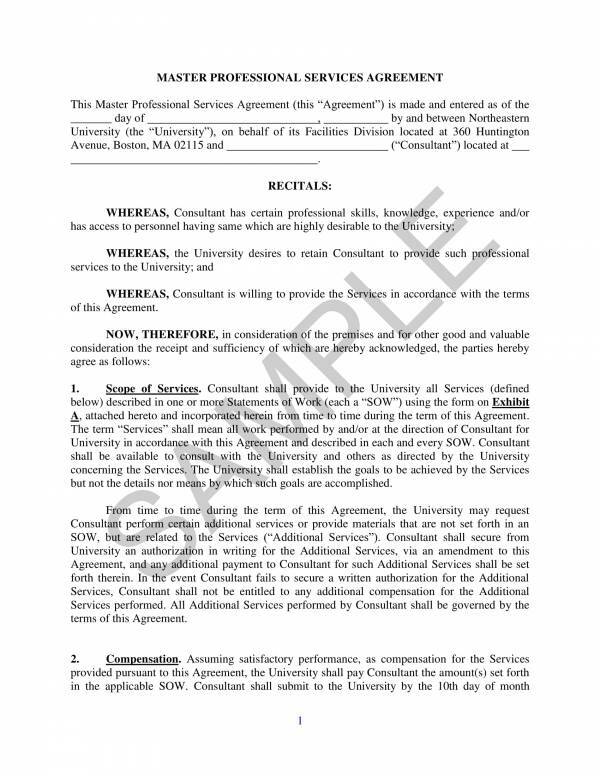 The specific type of agreement we will be covering in this article is a master professional services agreement. We will define what it is, check out its uses and many more. Agreement samples and templates have also been provided for your reference. What is the difference between MSA and SOW? 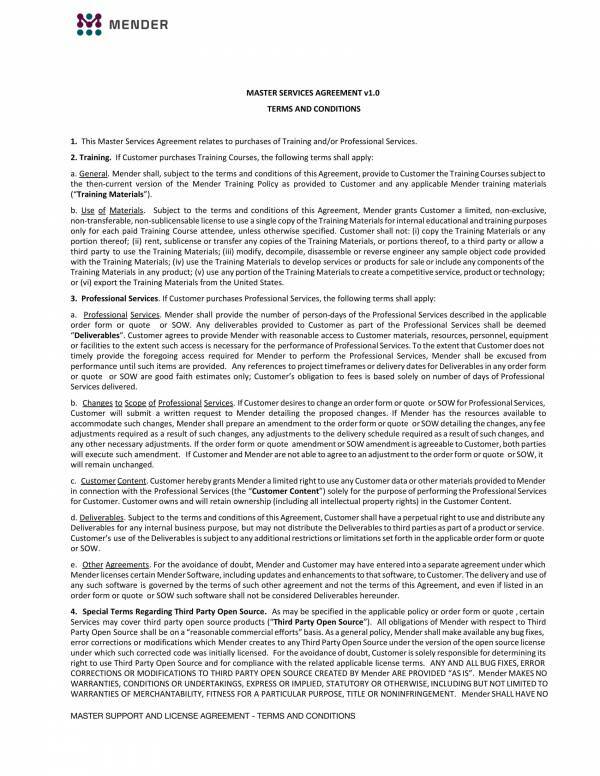 A master service agreement or MSA is a type of contract agreement where the parties involved agree to most of the terms and conditions provided in the agreement that will govern transactions in the future and other future agreements. This agreement allows the parties involved to be able to quickly negotiate future transactions or agreements as they no longer need to negotiate the same terms repeatedly. They only need to negotiate the terms that are needed for the specific deal or the latest deal they are going to transact about. The reliability and the strong foundation of the master service agreement makes this easy transaction possible, especially for future businesses. 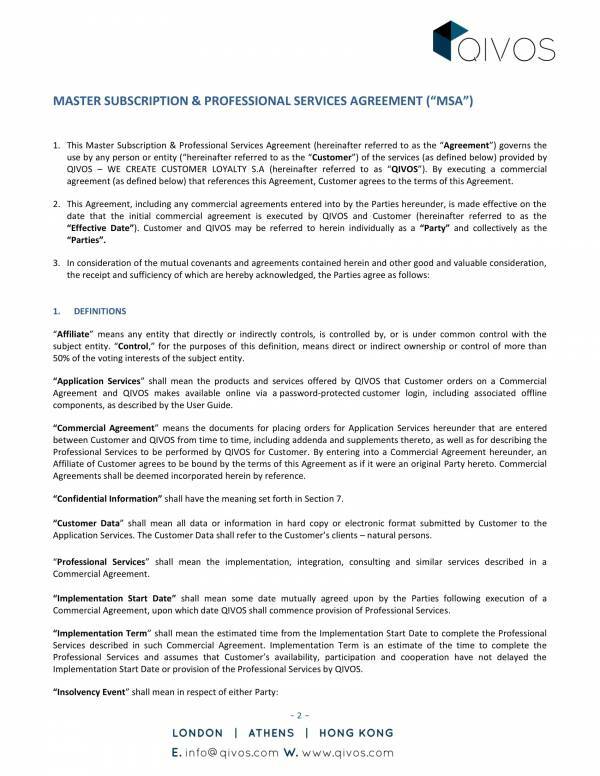 Open-ended fields, like information technology contract and research contracts are negotiated as a master service agreement. 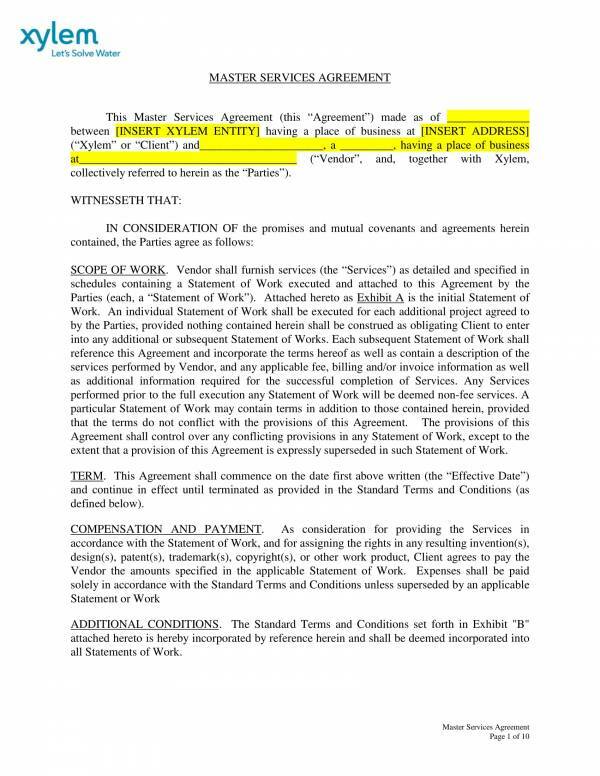 A statement of work or SOW on the other hand is a document that accompanies a master service agreement. Which tell us that they are not the same thing and they function differently. A statement of work deals with the specific details of a single project or the scope of work of a project. 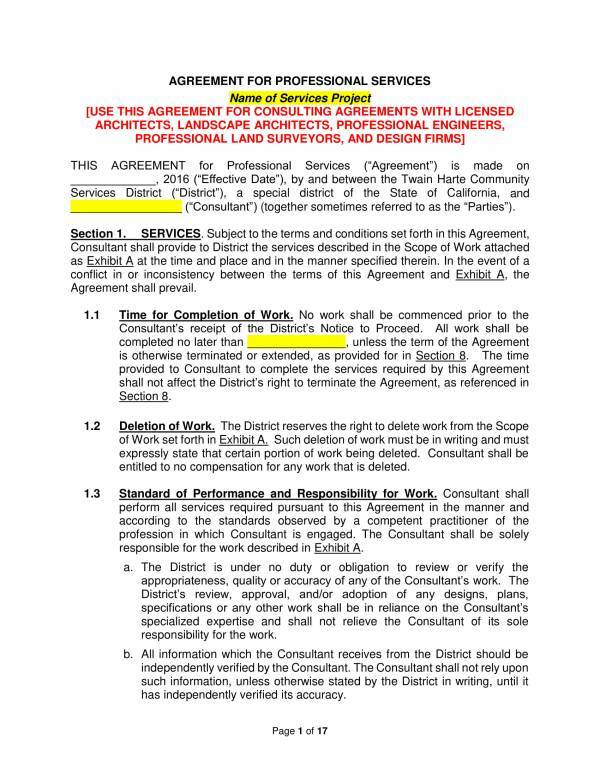 It is more project focused and provides more context compared to that of a master service agreement. 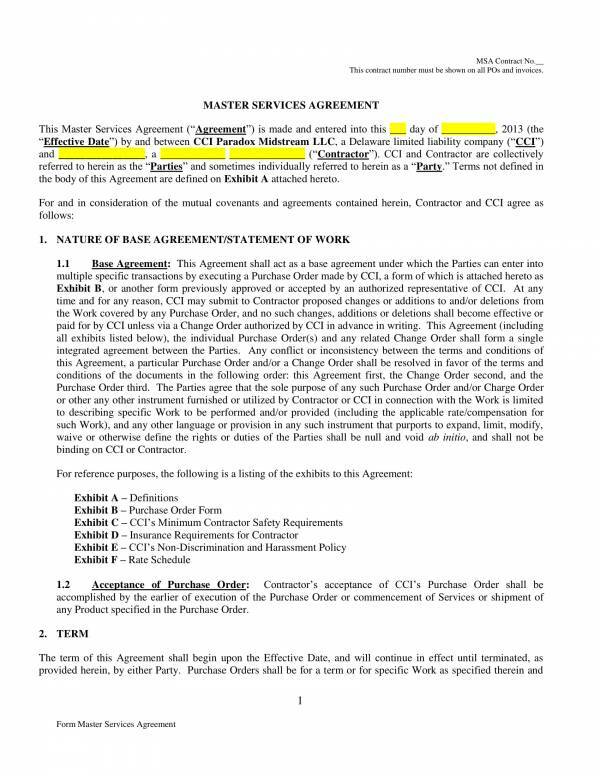 The difference between a master service agreement and statement of work can be further differentiated based on the topics that they address. We have provided a list of them below. Other relates and useful topics you may just be interested in are Info about Franchise Contracts and Agreements, Printable Lease Agreements, and HR Agreements Samples & Templates. Certain elements are necessary necessary in order for a contract to be considered valid. Without these elements, the contract will not be identified as a valid one that is why it is important that you should know abut them before you get yourself involved in one. A contract starts with one party offering it and another party accepting it. If the offer is accepted by another party, this then becomes an agreement. Agreements finds its roots in the offer and acceptance stage where everything in the agreement is created. There must be a meeting of the minds or what is called a consensus ad idem. When you say meeting of the minds then that means that all of the parties involved must agree to the same terms and conditions provided at the same time and with the same sense. Any disagreements would make it invalid, especially if the contract has not been signed, sealed and implemented. This refers to the intention to go court if any of the parties fail to do their part in the agreement or if they do not fulfill their promise as provided in the agreement. A legal obligation must be created in the agreement to make the parties accountable with what they must do. This means that the parties must join and give their consent of their own free will. There should be no coercion or forced used that lead them to give their consent and join the agreement. The consent should also not be earned through fraud, misrepresentation of facts, undue influence, and mutual mistake of facts. The agreement being formed should be by the law and not against the law. An agreement that is lawful must not be involved in fraud, unlawful activities, immoral acts or acts that are opposed to public policy. If an agreement is involved in these flaws and other illegal flaws, then it cannot be enforceable by the law. Each of the parties involved in the agreement must be able to get something in return for the promise that they had made. That is what consideration means here. If one party only gives and the other receives without giving something in return, then what is taking place is no longer an agreement, but gift giving. In an agreement, something should be given in return for something. Even if an agreement is able to meet all of the elements of a valid contract, if they have been expressly declared as void, then there is no way that it will be enforceable in the court. The agreement must be something that can possibly be performed in real life because if it is impossible to do, then the agreement will not be considered as valid. If the agreement is impossible to do, regardless if the parties are both aware of it or not, the agreement is considered void. The terms provided in the agreement should not be vague, uncertain and confusing otherwise this will make it invalid. The parties then will not be bound or obligated to follow the agreement. Therefore, the agreement must mean something certain or it should be capable of being made certain. Agreements can either be verbal or written. Legal formalities mean conforming to legal requirements as required by the law. For example, a verbal agreement is made for the sale of a car or vehicle. 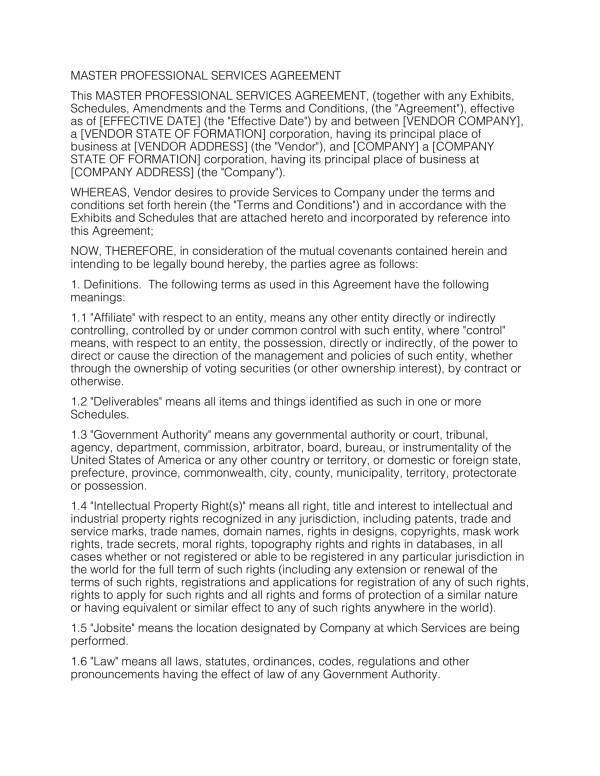 The law requires a written and registered agreement for this types of transaction. Thus the oral agreement of the sale of the vehicle is unenforceable. Finding out if the contract is valid or not will save you from a lot of trouble and fraud. You may want to check out other related topics, like Investment Agreements Samples & Templates, Transfer Agreements, and Release Agreements. What do you need to do to be able to come up with a better agreement document? Well, I say you need to know about certain tips that can help you make them better. Want to know what those tips are? If you do, then you can check out the tips that we have listed below. 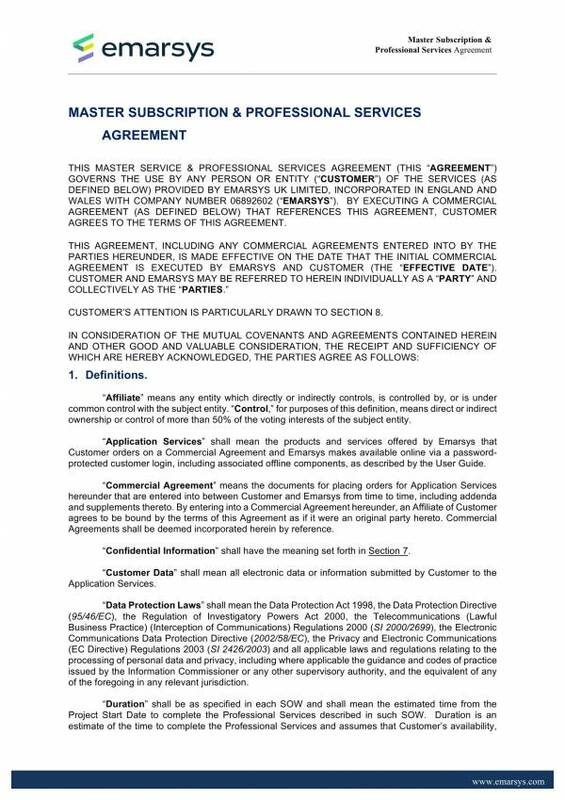 Use a complete and reliable agreement template. Agreements can give you the best examples and the best tips and instructions that you can use on how to be able to make your own agreement better, aside from being used as your reference on what things to include in it. You can even use it as your own. Provide a table of contents. If your agreement gets a little long or really long, like a couple of pages long, then you may need to add a table of contents. 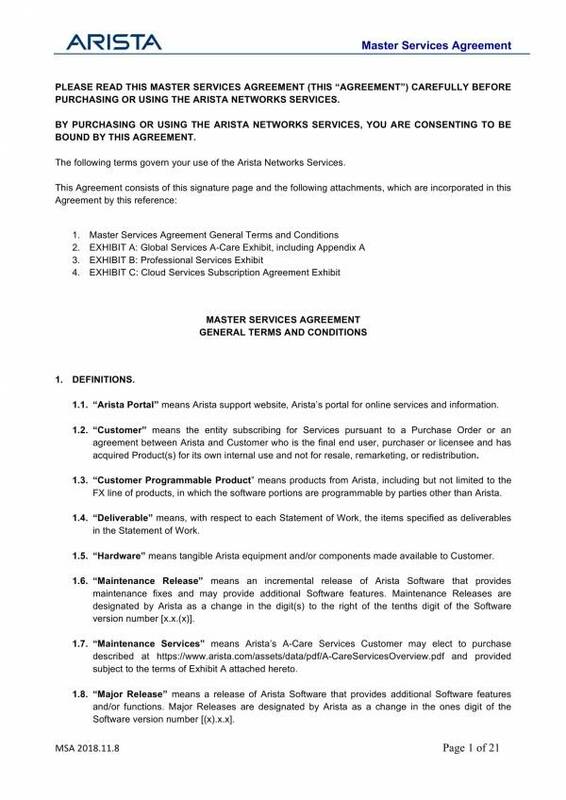 This is so that you can easily find the different sections in the agreement that you or your reader would want ti check out without having to scan every page. Always include the complete names of the parties involved. How do you bind the parties involved in the agreement? One way is to have their complete names listed in the appropriate appropriate section of that agreement, including their designation, address and their specific role in the agreement. This way you can distinguish them from all other people and ensure that they are aware that they are involved in the agreement. Simple words over impressive words. It is hard to understand something if you do not know or are not familiar with the words being used in it that is why it is important that you use simple words when the agreement document you are making. But that may just seem difficult as there are a lot of technical terms involved. If the term cannot be simplified then provide a definition of terms to help your readers understand what those difficult words mean. Be clear and concise with your sentences. Avoid using ambiguous words and confusing words. You need to reach a common understanding in an agreement and confusing words would definitely do the opposite. Think about how your sentences are constructed ensure that they are not confusing or misleading. Include important and related clauses. The clauses included in the agreement depends on its purpose, although there are several clauses that are commonly used on on a number of agreements. Knowing which ones are appropriate and necessary to your agreement will definitely help. Have all parties affix their signatures. Another way to bind the parties involved in the agreement is to have their signatures affixed in the document. Of course you won’t force them to. They should be well-aware of everything about the contract and give their consent to it. Their signature would serve as proof of their consent. Review and proofread your document. Checking for spelling errors and grammar errors will greatly help you improve your writing. This will not only make it better, but will also make it look professional and reliable. These tips will definitely help you make a better and more professional contract agreement that is also reliable. Because you can’t be forever a newbie and you can’t forever be a failure at something, that is why tips are there to help you. Who says you need centuries and ages to get better at something when you know the right tips that can help you? You may also want to check out other related topics, like Exchange Agreements, Outsourcing Services Agreement Templates, and Sample Master Service Agreement Templates. Want to know how wonderful templates are? Well, you should check out these advantages to find out. Easy and convenient to use – Agreement templates makes the task easy four you to do because you just simply fill in the blanks with the required information and you are good to go. That not only makes it easy to do, but it is also convenient as well. it is hassle free. Save time, energy and brainpower – Because the template already provides you with the necessary details, you no longer need to recreate the same document from scratch. It not only saves you time, but you can also save energy and brainpower. You no longer have to think of important details that the template provides. Ready for use – It is a simple and ready to use document. You just need to open the document, fill in the needed details, save and print. Accessible – There won’t be any problems finding the templates as they are available online. Just key in the key words to find the template and it will give you a list of options where you can get them. Mostly free – Worried about having to pay for it? That’s no problem because most of the templates offered in many websites are free. If they ever come with a fee, rest assured that it wouldn’t hurt your pocket. Editable and printable – If there is anything you want to change or you want to remove in the template then you can definitely have that done. Templates are editable and also printable so that it will be easy for anyone to personalize them and produce copies. Reliable – The templates that you see available online have been checked and updated multiple times by professionals so you can be sure that they are not only useful, but reliable as well. With those advantages, what more can you ask for? If you are not using templates, yet, then it’s high time you start using one. You can find a selection of templates on our website about agreements and other types of document. 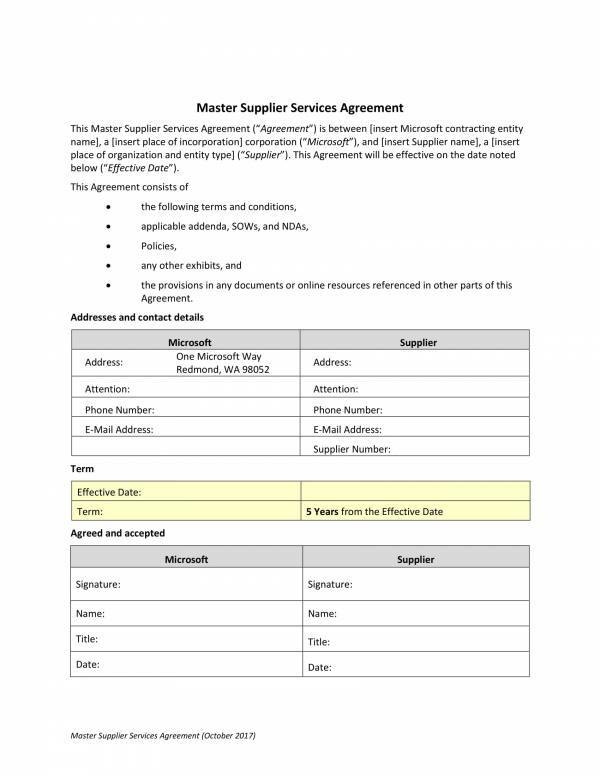 Some of the articles you can find there are Sample Vendor Agreements, Service Level Agreement Samples, and Sample Marketing Agreement Templates.